Old Wood Floor: Do You Think It’s Time for Replacement? It’s true. Wood flooring is some of the most commonly used floorings, and rightfully so. It’s absolutely beautiful! It gives a room such a cozy and warm look. It creates an elegant yet welcoming appearance. Wood floors hold warmth, which makes a room feel nice and comfortable! This flooring is pretty durable and can last for a long time. Maintenance isn’t much of a worry at all. Seriously, what’s not to like about wood floors? They’re basically the best thing since sliced bread. Right? Well, not quite. Every type of flooring there is can let you down one way or another. Perhaps, wood flooring is too hard to the touch for some people. Or, maybe it’s not as elegant as stone flooring. There will always be preferences when it comes to flooring. But, there are also problems when it comes to this part of a building. And the old wood floor in your home are not exempt! Sometimes, issues arise that might make a person think that it’s finally time for a wood floor removal job. That is the question. It’s not always easy to part ways with the beloved flooring in your home. Maybe this old wood floor is where your kids took their first steps. But, there comes a time when flooring just has to go. Sometimes, people aren’t sure whether or not they should rip up and replace their floors. Many wonder if they can maybe get a few more good years out of the wood planks under their feet. Are you currently wondering if it’s really time for a wood floor removal job? Well, first, check out some of the common problems that occur with wood flooring. Scratches – Although wood floors are durable, scratches can occur. Staining – Big, stubborn stains can appear on your home’s wood floors. These stains might be very difficult or even impossible to clean. Peeling – Sometimes, the finish on wood flooring can peel. It’s definitely not a good look! Water damage – It can cause cupping or crowning in the wood flooring. In other words, your wood floor planks might sink lower or raise higher than their edges. Excess moisture could also cause the flooring to buckle. This means that the planks might actually lift out of place. Wear and tear – After years of foot traffic, your wooden flooring can show major signs of wear. This could be shown through deep scratching or discoloration. 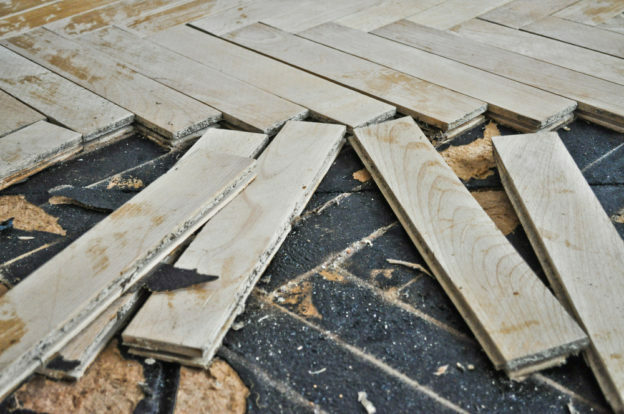 If you’ve noticed these or other issues with your wood flooring, then it just might be time. You may want to start looking into getting a wood floor removal service. One thing we should mention is that there’s a right way and a wrong way to remove an old wood floor. It should be done extremely carefully. If the process is done too quickly or without skill, there could be problems. For instance, you could accidentally cut into the subflooring. Also, clean up time might take quite a while. So, why not have someone else take care of your needs? How about a professional service? DustBusters Floor Removal offers services in South Florida. We remove residential and commercial flooring. Although you can find some help with DIY floor removal methods, this route might not be the best for you. It can be especially hard if you don’t have enough time or helping hands to get through the whole process. So, instead of struggling to find the time, you can take a few minutes to call us here at DustBusters! We can take care of the removal process quickly, cleaning up the mess in no time at all! Give us a call today and let us help you take care of your floor removal needs!